Sir Timoti Karetu and Dr Wharehuia Milroy are widely recognised as two of New Zealand's leading teachers and scholars of Maori language and culture. They both taught at The University of Waikato from the 1970s and pursued an innovative approach by teaching language courses in te reo Maori, with tikanga courses taught in Maori and English. Te Wharehuia and Timoti were pioneers in this area, forging a model for teaching Maori which is now followed by many other tertiary institutions. This is a book of chapters on key aspects of Maori language and culture authored by two of this country's pre-eminent kaumatua. The authors discuss key cultural concepts (including mana, tapu, wairua, whakapapa, ritual, farewell speeches and Maori humour) as well as language and cultural issues of the modern world. 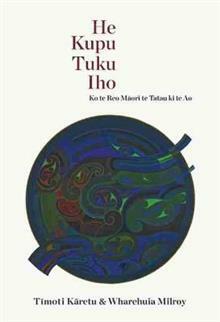 The language used is an exemplar for learners and speakers of te reo Maori. With assistance from a team at Te Ipukarea, the National Maori Language Institute, who transcribed and edited structured conversations between these two kaumatua, this book preserves the voices and ideas of these two renowned scholars for present and future generations. Sir Timoti Samuel Karetu QSO, KNZM (Ngati Kahungunu, Ngai Tuhoe) is considered the master of the Maori language and an expert in the composition, performance and judging of haka and waiata. In 1972, he established the Department of Maori at The University of Waikato as head of department and then was foundation professor before becoming the inaugural Maori Language Commissioner at Te Taura Whiri i te Reo Maori (1987-1999). In 2012, he was the recipient of Te Tohu mo Te Arikinui Dame Te Atairangikaahu Exemplary/Supreme Award of Te Waka Toi. Timoti has also served as information officer for the New Zealand High Commission in London. He is currently co-chair of the board for the Te Kohanga Reo National Trust. Timoti has been involved with the National Film Archive and has served on the boards of Te Waka Toi, Toi Maori, and the National Library, as well as serving as chairperson of Aotearoa Traditional Maori Performing Arts Festival Committee (now Te Matatini) and Te Mangai Paho. He was awarded honorary doctorates from Victoria University of Wellington in 2003 and The University of Waikato in 2008. He has been a regular contributor at national and international symposia, delivering presentations and papers on indigenous language revival and retention. He with co author Wharehuia Milroy are directors of Te Panekiretanga o Te Reo Maori (Institute of Excellence in Te Reo Maori), which they established in 2004 through Te Wananga o Aotearoa. They are also adjunct professors of Te Ipukarea, the National Maori Language Institute at AUT University. Both were born in 1937. Dr James Wharehuia Milroy QSO, CNZM (Ngai Tuhoe and Ngati Koura) was a professor of Maori at the University of Waikato from 1993 to 2000, having taught there since 1978. Because he is an exponent of the Maori language and an expert in Maori customary practices he is often consulted, including as an examiner of numerous master and PhD theses in English and Maori. Outside of academia, Te Wharehuia has served on many boards and committees including Te Ara Wananga, an advisory committee for the Online Encyclopedia of New Zealand; Te Papa Maori Advisory Committee; Te Taura Whiri i te Reo Maori; Tertiary Education Advisory Committee; Whakaruruhau Reo for the New Zealand Qualifications Authority; the New Zealand Geographic Board; the Waitangi Tribunal; Tautoko Maori Trust; and Te Kohanga Reo National Trust. In 2009 Te Wharehuia was awarded Te Tohu Aroha mo Ngoingoi Kumeroa Pewhairangi Award for strengthening Te Reo Rangatira. He was the inaugural Pou Aronui of Te Whainga Aronui/The Council for the Humanities. He received an honorary doctorate from The University of Waikato in 2005. He with co author Timoti Karetu are directors of Te Panekiretanga o Te Reo Maori (Institute of Excellence in Te Reo Maori), which they established in 2004 through Te Wananga o Aotearoa. They are also adjunct professors of Te Ipukarea, the National Maori Language Institute at AUT University. Both were born in 1937.